A planter, a welcome sign & a birdhouse all in one! 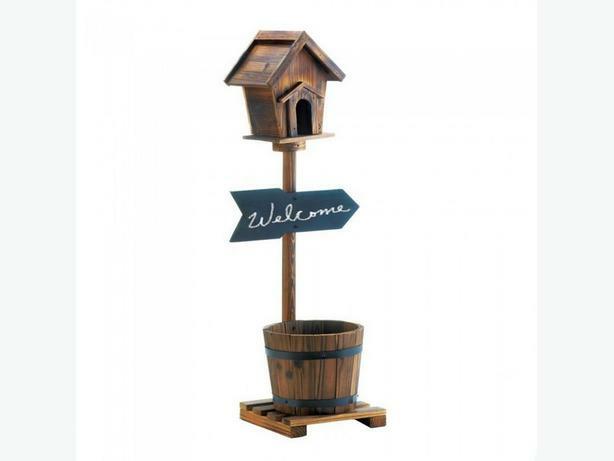 This unique yard accent adds rustic style & cottage-chic to your outdoor space with its birdhouse on top, a chalkboard sign (chalk not included) & a metal-banded barrel planter below...12" x 11" x 31.2" tall & weighs 3.6 lbs. (bucket is 8.25" diameter x 6.5" high) assembly required!